OK Solutions is leading provider of pre-owned / used envelope inserting systems for direct marketing and transactional applications called used mailingsystems. Our wide range of envelope inserting systems is listed below and availability can change any day. We can offer pre-owned standard Bell & Howell, used Buhrs BB300, BB600 and used Buhrs BB700 envelope inserting systems and the well known Grutzmacher inserting system up to the highest level such as the former Buhrs envelope inserting systems today known as the Winkler and Dunnebier Direct Marketing envelope inserting systems. The CMC Easy is an entry level, envelope inserting machine which is capable of processing the most complex direct mail at 8,000 per hour. It is also proving to be extremely popular. The CMC Easy features a user-friendly, touch screen control panel. Highly reliable rotary feeders with double and miss sensors. Up to 6 feeders are available per line. Machinable envelopes DL-C5-C4. Face up envelope inserting allows a range of intelligent systems such as ink-jets, cameras, and readers to be quickly and conveniently added. The Buhrs BB300 gathering line is a entry-level system, based on a mechanical platform. The Buhrs BB 300 gathering line is especially designed for mailings with the same content. This system allows you to process all common DIN formats as well as specially-sized mailings. Because of the Buhrs BB300 gathering line it's user-friendliness and short changeover times the BB300 can be used for mailings with constantly changing job parameters and small numbers of mailing products. The Buhrs BB700 inserter is the fastest system of the envelope inserting product line. The BB700 envelope inserting system can process formats from C6 to B4 at 14.000 cycles per hour. The BB700 inserter is ideal for the transactional segment where the intelligent processing and personalizing of inserts/envelopes is crucial. It always offers security and reliability. But also Direct Mail provider will find a multitude of application possibilities with this Buhrs BB700 envelope inserter. The servo driven feeders of this inserting system can be placed in any position, and can also be mounted on every other envelope inserting system of this product family. Soon available, an as new W+D / Buhrs BB700 inserter, one of the fastest system of the envelope inserting product line. The BB700 envelope inserting system can process formats from C6 to B4 at 14.000 cycles per hour. The BB700 inserter is ideal for the transactional segment where the intelligent processing and personalizing of inserts/envelopes is crucial. It always offers security and reliability. But also Direct Mail provider will find a multitude of application possibilities with this Buhrs BB700 envelope inserter. Soon available, an as new in mint condition W+D / Buhrs BB700 inserter, one of the fastest system of the envelope inserting product line. The BB700 envelope inserting system can process formats from C6 to B4 at 14.000 cycles per hour. The BB700 inserter is ideal for the transactional segment where the intelligent processing and personalizing of inserts/envelopes is crucial. It always offers security and reliability. But also Direct Mail provider will find a multitude of application possibilities with this Buhrs BB700 envelope inserter. The Buhrs BB300 envelope inserter is designed for standard applications for DL-C4 formats. This Buhrs BB 300 envelope inserting system allows you to process different materials and paper qualities fast, with high format flexibility and utmost reliability. As a result, the Buhrs BB300 envelope inserter especially service bureaus and direct mail providers who choose this system to handle large mailing volumes. The feeders of the Buhrs BB300 envelope inserting system can be placed at any position. This BB300 is equiped with a Intelmail VAF feeder which can read, collate and fold sets which will be fed to the gathering trace for the BB300. Kern - a market leader in providing mailroom solutions - has now introduced its latest technology - the Kern 3500 Inserting System - to its comprehensive range of inserting systems. Its unique design and high speed capabilities mean the Kern 3500 Inserting System can process pre-cut single sheets, as well as continuous forms from fanfold stacks or rolls, more efficiently than ever before. The CMC 250 is widely regarded as "THE industry workhorse". Delivering a combination of: high speed, "no-stop" management system, variable specification options, almost infinite upgrade possibilities and the ability to process all of the most common envelope sizes (DL, C5, C4) with consummate ease. The CMC 250 can have a huge range of ancillary equipment added to the machine. The Buhrs BB700 inserter is the fastest system of the envelope inserting product line. The BB700 envelope inserting system can process formats from C6 to B4 at 16,000 cycles per hour. The BB700 inserter is ideal for the transactional segment where the intelligent processing and personalizing of inserts/envelopes is crucial. It always offers security and reliability. But also Direct Mail provider will find a multitude of application possibilities with this Buhrs BB700 envelope inserter. The Buhrs / Winkler and Dunnebier BB300 10K envelope inserter is a entry-level system, based on a mechanical platform. The Buhrs / Winkler and Dunnebier BB 300 10K envelope inserter is especially designed as an off-line version and is ideal for mailings with the same content. This system allows you to process all common DIN formats as well as specially-sized mailings. The Buhrs / Winkler and Dunnebier 10K BB300 envelope inserter is a perfect solution for letter shops, mailing houses and printers. 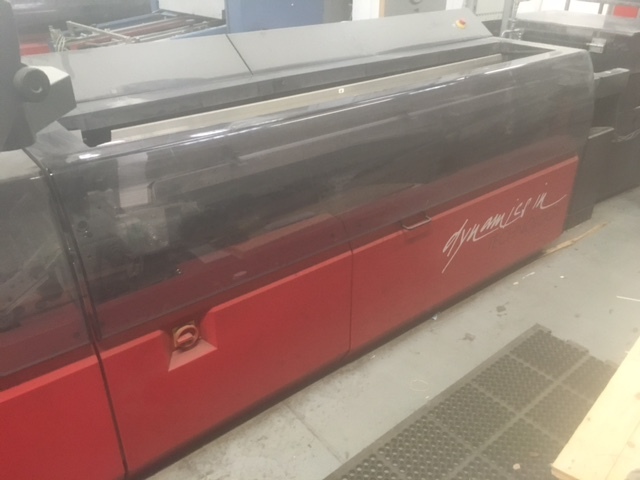 Müller cutsheet pagefeeeder incl autoloader, Hi cap feeder (32000/h), BCR reading, gathering and folding module.